Paradise Farmhouse is a place of exceptional peace and restfulness, situated less than a mile from Presteigne, with spectacular long-ranging views that our luxurious new-build cottages are designed to maximise for your enjoyment. 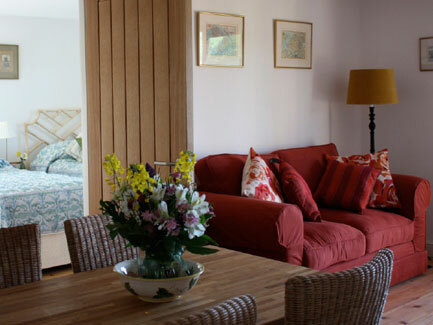 Available for self-catering or bed and breakfast, we sleep 13 people in total in six double or twin bedrooms, each with en suite bath or shower room. 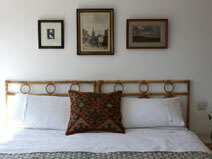 Alternatively, we offer two self-catering flats which each sleep four people. 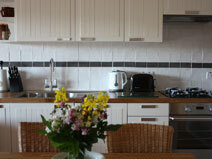 One of the rooms has a fully equipped en-suite shower room for people in wheelchairs or with restricted mobility. Enjoy a game of ping-pong in our games room, play Scrabble while cosying up to the wood-burning stove, or prepare a barbecue and eat al fresco. And if you want to put your feet up, then head for a hammock, lie back and absorb the views. Whatever your choice, we guarantee you a warm welcome and a break that will recharge your batteries.